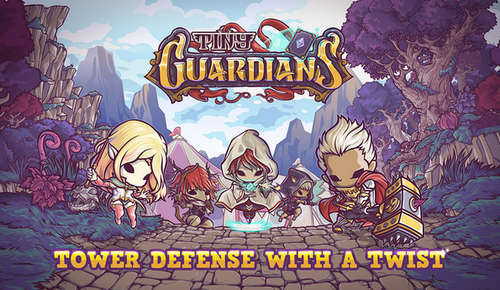 Tiny Guardians by Kurechii is an engaging new take on regular tower defense strategy games. It has inverted tower defense mechanics and includes no towers. You just need strategy skills to defeat hordes of enemies. This tiny adventure takes place in the wilderness of Prism, a place where many monsters live. As you start the game you choose your tiny hero and start defending yourself and attacking enemies charging at you. You can get the game for free by downloading Tiny Guardians v1.1.5 apk from us. You can even install a Mod version with unlimited Money, Stars, Battle Point & Mana. However this is not like your typical TD game, the "inverted" part I mentioned earlier means you are the one moving down the pathway, dealing with different enemies as they move across. As you kill the monsters they you can summon in additional units, or upgrade the ones you already have.. friendly units are a rare commodity here, so use them wisely! - Pre-battle unit selection bugs fixed. - Unnecessary permissions have been removed. - Characters purchased through the bundle did not appear previously - it has now been fixed. Extract data to sdcard/Android/obb/, install the apk and play. You can learn more about the game on its official Google Play page.